Not only is Hymer a present-day motorhome manufacturer but it is also a creator of history and has some serious, ground breaking motorhome milestones under its belt. For those ardent historians out there, we have outlined a ‘brief history of time’, spanning over 90 years since Hymer’s story began. 1923 is when the journey began with Alfons Hymer (the father of Erwin Hymer) starting production of agricultural vehicles in his repair shop. 44 years later, the first ‘caravan’ (the Eriba range) was built by Erich Bachem and Erwin Hymer. Production began in 1958 with over 150 being produced every day after around one year. It was 1961 when the first Hymer motorhome was built, named the ‘Caravano’. In 1971, at the Caravan Salon show, the very first Hymermobil was presented. Five years later, in 1976, the 521 becomes a ‘best-seller’ with its pull-down double bed in the cab area. The PUAL body shell, which is used today in Hymer motorhomes was developed by the Hymer team. 1981 was a monumental year for Hymer but it was yet to realise the phenomenal success of the B-Class, which was later to become the most popular motorhome in Europe. Pioneering Hymer does it again in 1986 when it announces that it will be granting a 6 year warranty for water ingress on its motorhomes. The S Class makes its debut in 1995. In addition, this year, Hymer receives the ISO 9001 certificates recognising the high quality products it produces. The factory in Bad Waldsee sees the monumental 100,000th motorhome completed on the Hymer production line in 2004. 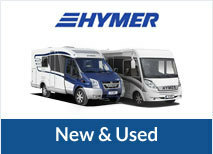 2007 marks the 50th year for Hymer and as a celebration, the B –Class SL is built in gold. In 2011, the now famous Erwin Hymer Museum opens opposite the company’s headquarters in bad Waldsee. Hymer continues its success for ground breaking innovations with the 3-ton class which sees new standards in the whole motorhome industry. Just 10 years following the 100,000th motorhome, Hymer celebrates its 150,000th motorhome making its way off the factory assembly line. 2015 saw the first integrated motorhome on a Mercedes Benz chassis, the Hymermobil M-LI weighing less than 3.5 tons – another landmark in the history of Hymer, with no doubt, lots more to come. If you would like more information on Hymer servicing or sales, please get in touch with our Hymer experts at Travelworld. Call us on 0844 880 4938.